Outdoor grilling was not in the cards, so the red bell peppers, poblano, and eggplant were all done under the broiler. In a totally inauthentic last-minute detour, I put everything in the food processor instead of mushing it all with my hands. I did do the garlic and salt in a little mortar though! This poblano pepper was unusually hot, so I omitted the cayenne, using only Aleppo. Heeding the note that the flavor improves daily, I made this several days before its scheduled appearance at dinner. I did taste it daily, and it did develop nicely. I missed the mild smokiness usually found in ajvar, and know it would be better had I grilled the peppers and eggplant. I might toss a little smoked paprika into the remainder (the recipe makes a lot), to compensate. I served it with flatbread, but noticed a couple guests just eating it by the spoonful! We will be enjoying the rest of it with sausages or fish. The recipe in the book does not give the option of including pork or lamb, which many other recipes do. 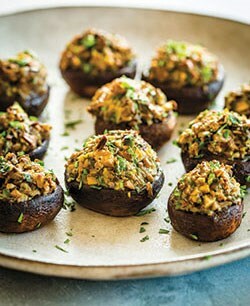 I think it would be a nice addition, I also think these would be good made entirely with ground lamb. I ground the beef from trimmed chuck steaks, and we actually thought these came out a tad dry, so maybe a bit more fat was needed. They were cooked on the big egg, without skewers. We don’t have club soda hanging around, and it only comes in big bottles, so I used San Pellegrino water instead. I’m not a fizzy person, so I’m not certain how different it is, but I suspect its natural effervescence is not equal to the carbonation in club soda. I served these with ajvar, Turkish yogurt sauce, sliced red onion, and grated cucumber salad on the side. It all made for a lovely dinner, but I probably could have stood to increase the spice level somewhat. The next night we had the remaining c´evapc?ic´i on flatbread, with ajvar, and some goat cheese, which was also a nice combination. This is a fish dish non-fish eaters will like. Sole has very mild taste and the sauce used here is rich from addition of cream but not cloying. I liked the addition of bay leaf to each fish roll because it certainly perfumed the rolls but it was a bit of a nuisance having to pull out the bay leaves while eating. I also placed a piece of onion slice inside the rolls and really liked this inclusion in taste. 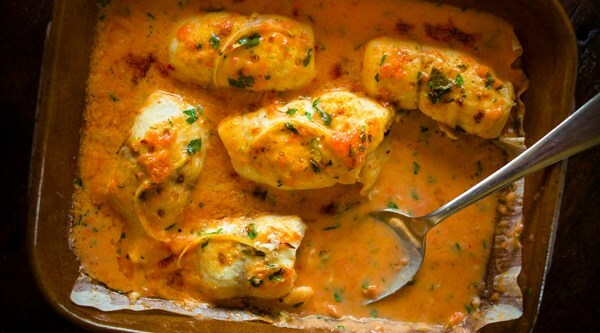 The sauce is rich but mild in flavor with a hint of fresh tomatoes coming through. For those who prefer spicier taste, maybe addition of hot sauce to your taste. Served with mashed cauliflower. Seriously delicious. Made few changes to the recipe. Added aleppo pepper to taste and used my own roasted Roma tomatoes I always keep in the freezer for half the portion of tomatoes and made up the rest with fresh tomato per recipe. Although I served these with cucumber sticks, this will go so well with scrambled eggs, pita, or an accompaniment to grilled beef, chicken, pork, or fish. 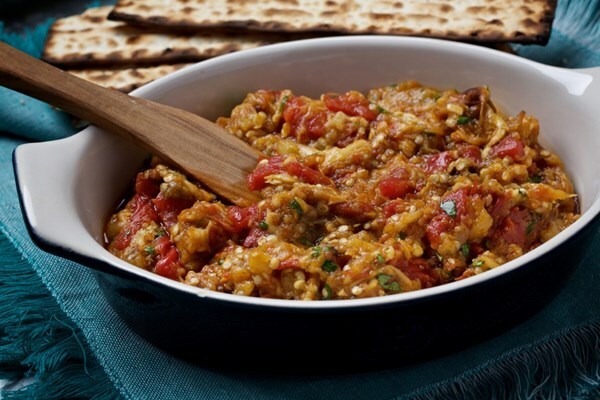 Somewhat similar to eggplant dip/salad served nearby at Oren's Hummus Restaurants in Palo Alto and Mountain View, CA. So simple to make too. This recipe is also included in The Food of Morocco. The main differences are as follows: The amount of cucumber is doubled in Unforgettable, to 900 gm. TFOM calls for two tablespoons of lemon juice or vinegar, Unforgettable calls for two teaspoons for twice as much cucumber. Unforgettable calls for adding a tablespoon of olive oil. The amounts of oregano and sugar are the same in both recipes. Anyway, there’s not much to it! I didn’t add any sweetener, it didn’t seem to call for it. I used fresh oregano from the yard, but ended up adding a bit of dried za’atar also. This didn’t knock me out, but it was fine, and a refreshing accompaniment to the other dishes in our dinner. I actually think the proportions in TFOM version might have been more to my taste, and I wonder why it was modified in this way. I’ve had a clay tagine for years, but I’ve been unreasonably terrified of using it with actual heat. I finally got up my nerve and stuck it on the burner, over a diffuser. Whew! It didn’t crack, and it produced a wonderful chicken dish! I used all thighs, instead of the thigh-leg combination called for. I didn’t have the nerve to stick the tagine base under the broiler, as the manufacturer stated the max temp as 390º. So the chicken pieces were fished out and went under the broiler on a sheet pan. The picholine olves are quite nutty, with a wonderful texture. If you can get them, I recommend it. We bought a small container of livers, fished out one, froze the rest. I do think the smashed liver adds a certain richness to the sauce. This is a long-cooking dish, so the house was filled with aromas. And it was delicious, with warm, enticing flavors. File this one under tastes far, far better than it looks in my photo. It does look lovely in the book, but not under my poor kitchen lighting, using a phone, and trying to snap photos while making cocktails and entertaining guests. I’ve included my photo anyway. I just used ordinary, but flavorful, green olives for this, because we had a ton of them, and I couldn’t find the cracked Greek olives called for. Hope I do one day, they sound delicious. But I don’t think we suffered much for the substitute. I used up the last of our dried porcini, which was less than the 3/4 cup called for. The porcini flavor was still quite evident, giving the bites an even more shroomy, earthy flavor, which stood up well to the olives. I utilized the option of preparing the mushrooms the day before, then baking them just before our guests arrived, which worked out very well. This was the recipe I was most wanting in this book, and unfortunately, it was a bit of a let down for me. The best thing about this recipe is that the ingredients are mostly ones I already had. I used the mortar and pestle method to make the picada, but I wished I had used my mini food processor. All in all, I found the recipe to be a bit fussier than it needed to be. More importantly, I just wasn't thrilled with the taste. I added a little lemon juice which helped a little, but it just isn't my favorite. Like the suquet this gets served with, I was disappointed by this recipe. I just wasn't a fan of the taste. You begin by toasting the rice in a frying pan over medium high heat for 9 minutes or "until the grains are lightly toasted". This instructions was really odd to me - at that heat, the grains were cooking way too quickly, so I turned the heat way down. Even so, the grains got quite dark and felt more than done to me after 7 minutes. You're supposed to add 1 cup of shrimp broth (plus a little salt, pepper, and nutmeg) and cook *uncovered* (still at medium high heat) for 20 minutes, stirring occasionally, or until the broth gets absorbed. Again, this timing was way off - I ended up having to add water and it still didn't cook to my satisfaction. I get why this might be a tasty dish, though I think the nutmeg should just be the faintest whisper. The timing was way off for my stove, though. My grocer had baby eggplants for the Holidays so I could finally make this recipe. The walnut spread is delicious. It does make about twice the amount that you actually need, but who's complaining. I did add some lemon juice to the spread to make it a bit less sweet. Made this with a variety of greens, as recommended although none of them wild. Alas, no lemons for garnish so I sprinkled some brine from a jar of preserved lemons on top- perfect! I made pretty serious modifications for this: I didn’t use the same proportions of greens, mine was heavier on leeks, scallions, and carrot tops; I steamed all the greens in a microwave steamer basket; I cooked the couscous separately to make sure it was done. I used the water from steaming the greens. I can’t stand buttermilk, but liked the idea of something to cut the bitterness of the greens, so I served it with a bowl of yogurt. I mixed everything together at the end, with the onion, tomato, garlic and spice mixture prepared as directed. It turned out great, even if not done in the recommended fashion. Mr. Nightshade kept remarking on the unusual flavor, which I think must have been the carrot tops, because everything else was pretty familiar. Or perhaps just the combination of ingredients, with the emphasis on herby greens. I really think one could use any greens in this, and I’d like to make it with arugula. 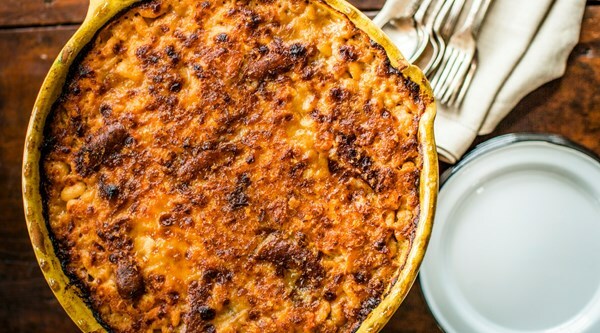 The recipe makes a lot, and the leftovers are just as delicious. For the saute step, turn the heat to medium for the first 10 minutes, then medium high for the last 5 minutes to get browner cauliflower. Use 500 grams of cauliflower. The amount called for was a bit too saucy. Do use the optional sugar, it needs it because of the large amount of lemon. ...functions as both a cookbook and biography of Paula Wolfert, the award-winning cookbook author. Unforgettable tells the story of culinary legend and author of nine award-winning cookbooks, Paula Wolfert, who was diagnosed with Alzheimer's in 2013. This biographical cookbook written by Emily Kaiser Thelin and photographed by Eric Wolfinger, shares more than fifty of her most iconic dishes and explores the relationship between food and memory. The gripping narrative traces the arc of Wolfert's career, from her Brooklyn childhood to her adventures in the farthest corners of the Mediterranean: from nights spent with Beat Generation icons like Allen Ginsberg, to working with the great James Beard; from living in Morocco at a time when it really was like a fourteenth century culture, to bringing international food to America's kitchens through magazines and cookbooks. Anecdotes and adventuresome stories come from Paula's extensive personal archive, interviews with Paula herself, and dozens of interviews with food writers and chefs whom she influenced and influenced her-including Alice Waters,Thomas Keller, Diana Kennedy, Andr? Daguin, and Jacques P?pin. Wolfert's recipes are like no other: each is a new discovery, yielding incredible flavors, using unusual techniques and ingredients, often with an incredible backstory. And the recipes are organized into menus inspired by Wolfert's life and travels--such as James Beard's Easy Entertaining menu; a Moroccan Party; and a Slow and Easy Feast. Unforgettable also addresses Wolfert's acknowledgement of the challenges of living with Alzheimer's, a disease that often means she cannot remember the things she did yesterday, but can still recall in detail what she has cooked over the years. Not accepting defeat easily, Wolfert created a new brain-centric diet, emphasizing healthy meats and fresh vegetables, and her recipes are included here. 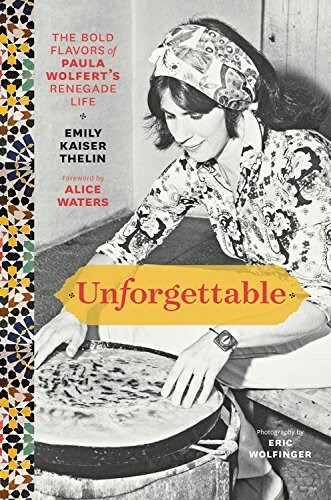 Unforgettable is a delight for those who know and love Paula Wolfert's recipes, but will be a delicious discovery for those who love food, but have not yet heard of this influential cookbook writer and culinary legend.